Radiopaq's Sound Jacket improves your iPod nano's sound, but is it worth the price? Are the sound improvements worth the extra bulk? Radiopaq says its Sound Jacket "acts like a graphic equaliser that automatically adjusts itself continuously to best suit the music that is being played". In other words, it means it can restore the detail and depth that's often lost during compression. Snugly housing your nano 4G without obscuring its controls or screen, it connects through your iPod's dock connector and offers a port in its base so you can charge and sync without removing it. Plug the earbuds into the Sound Jacket and they offer controls to adjust the volume and the level of influence. It's powered through the iPod, so no batteries are required. Sound Jacket certainly does an excellent job in revitalising harshly encoded MP3s. It makes for a warmer, richer and more complete sound, especially regarding bass reproduction, which is much more to the fore when using the device (some might find it a little too bass-saturated). But this increase in sound quality comes at a price. 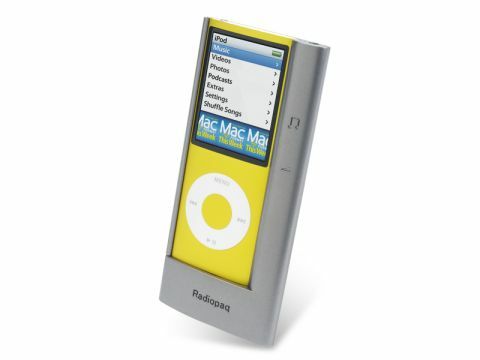 The thin iPod nano is considerably bulkier when it's slotted into the Sound Jacket, which is a significant drawback considering its small form factor is one of the nano's main selling points. You can certainly kiss goodbye to third-party peripherals such as carry cases, though it still fits most speaker sets because there's a dock adaptor on the bottom of the Radiopaq. As you might expect, the Sound Jacket does a lot less for music that's encoded at a higher bit-rate setting. So, surely encoding music at a higher rate to start with makes more sense than spending £70 on a micro amp that bulks up your nano?